How to Make a Photo Black and White? Do it in a flash with PhotoWorks! Puzzled about how to change a photo to black and white? Confused by different sliders in your current editor? No matter how many times you edit it, the picture just turns into a dull gray mess? Well, get ready and take a deep breath: I’ve got 4 different ways that will make this task pretty easy. First, why black and white? Isn’t this a downgrade? Many of us consider black and white photos to be a relic of the past. However, sometimes, a colorless pic can show much more details than the one with colors. Highlight a texture, focus on silhouettes, play with the contrasts between objects, add a light noise for retro mood - no colored picture will let you do that. Now, what about turning photos into black and white? How to do that and not break a sweat? Here are 4 different programs that will cope up with this task in no time. Keep on reading and discover a method that suits you. Imagine that you can turn your photo into grayscale just by ticking a box. No confusing dropdown lists or menus. Is that not a dream anymore? For sure! 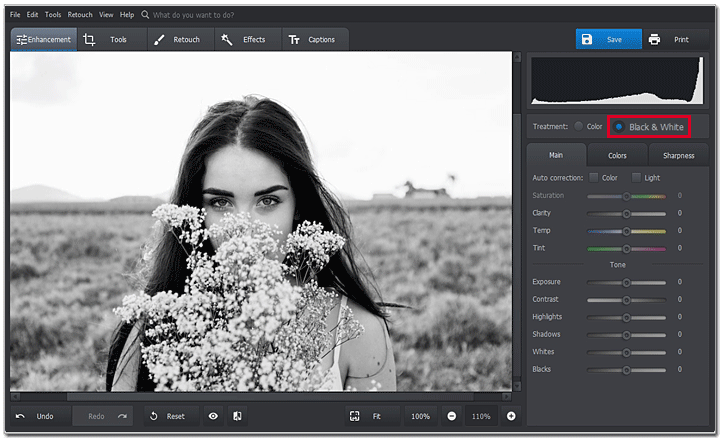 PhotoWorks is an easy-to-use picture editor that has a pretty simple interface and a whole lot of different tools. For instance, if you are not sure about the name of the tool you need, just type some keywords into the search field and the necessary option is found. Run the program and import your picture. Go to the Enhancement tab and check the Black and White box to remove the colors. If you need to tweak the result a bit, use the Tone sliders. For instance, you can increase or decrease the brightness by moving the Whites and Highlights sliders, while Shadows or Blacks let you correct the dark areas. When it’s done, click Save to keep the changes. Up to experiments but don’t know how to make photos look vintage? Now you don't have to deal with dull sliders and numbers, check out the Effects tab. There you will find dozens of gorgeous presets that will make your photo look retro-perfect without any editing. We recommend trying out the Vintage and Movies categories. Can't wait to check it all out? Just click the button below to start! That sounds really easy, doesn’t it? You can discover a whole lot of other creative possibilities while using PhotoWorks: from simple brightness and contrast correction to complex retouch for portraits and landscapes. If you have no desire to purchase an image editor for just a few pictures, then check out other, free programs. They may have fewer tools to play with, but can definitely be a lifesaver in some situations. For instance, MS Paint. Unlike other special editors, you don’t have to pay for a yearly subscription or even download anything. If you’re using, let’s say, Windows 7 or higher, Paint should already be pre-installed with the system. Start Microsoft Paint and import your image. Open the Image menu and choose Properties. Now check the Black and White box. Now click the Save icon to keep the new image. Paint is a really nice and useful program but don’t expect any miracles since it’s just a built-in Windows application. But if you are running the latest Windows 10 version, you can try out Paint 3D that has an extended toolkit and offers new possibilities for editing your pictures. 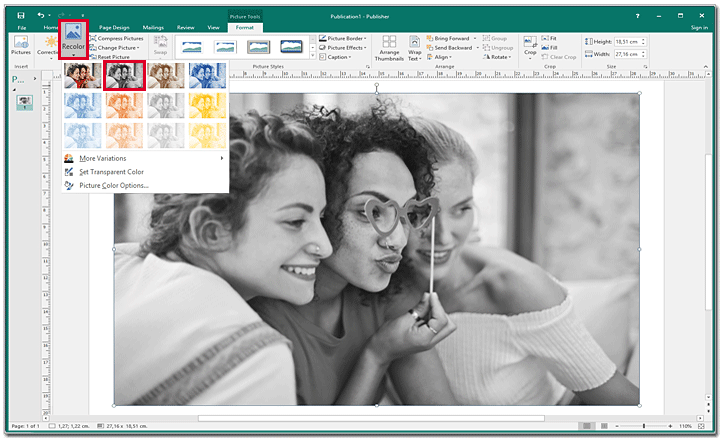 If you’re into making various calendars, greeting or business cards in special software like Microsoft Publisher, then this method is for you. 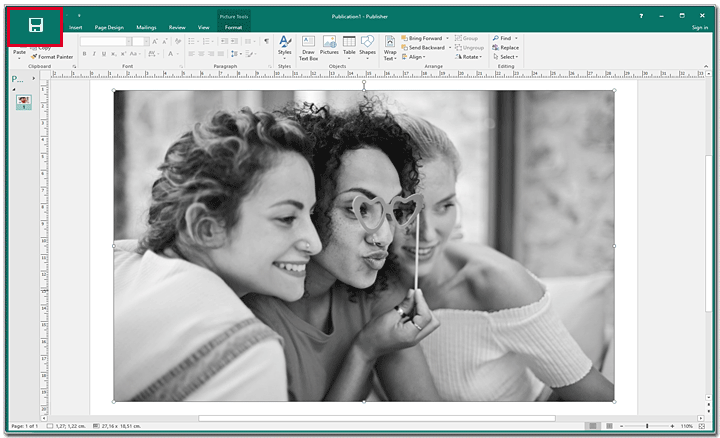 For those who don’t know, Microsoft Publisher is actually a part of the MS Office package, that we all use quite often for making presentations or writing documents. This one allows you to create different designs and layouts for further printing. What’s good, you can also work with images and edit them in a basic way. 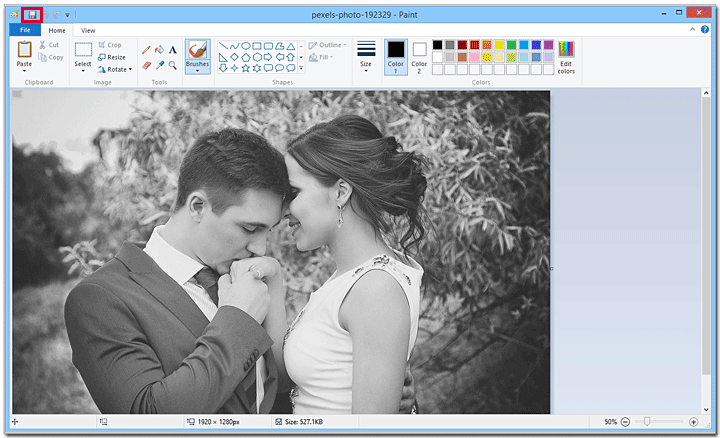 Start the program, create a new project and import your jpg photo. Position it on the page. Left-click your image to open the editing panel. Choose Recolor. Now select Grayscale from the dropdown list. Satisfied? Click Save to keep the edited image. Save it under some other name if you need to have the colored picture too, and perhaps tweak it once again later. Now let’s be honest, Microsoft Publisher is not an image editor. 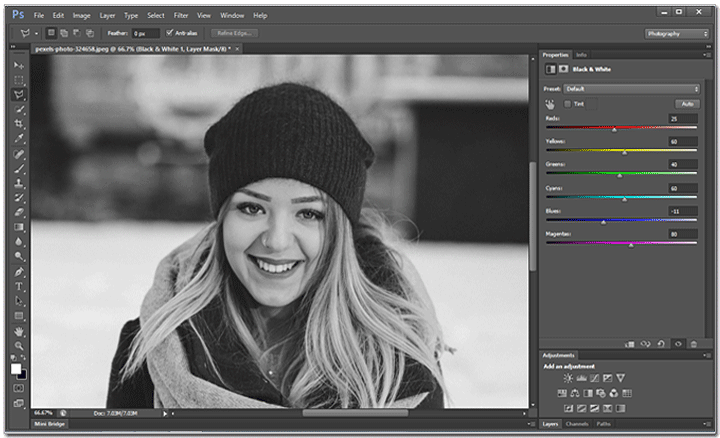 If you look for a complex retouch where applying the black and white filter is only a step in-between, then try other programs. However, if simple tweaks for a card or print is your goal, Publisher will help you achieve it for sure. 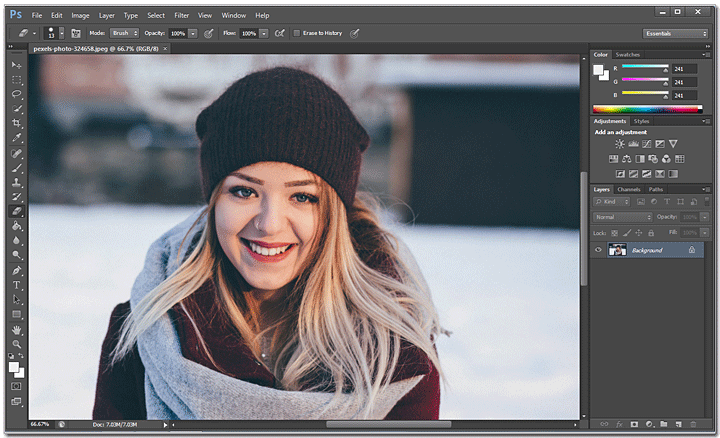 If you ask a person to name any image editor he or she knows, in 99% of all cases, Adobe Photoshop will be the first on the list. This program is truly considered to be a top-rated software for photo retouching. With it, you can bring to life almost any creative ideas. 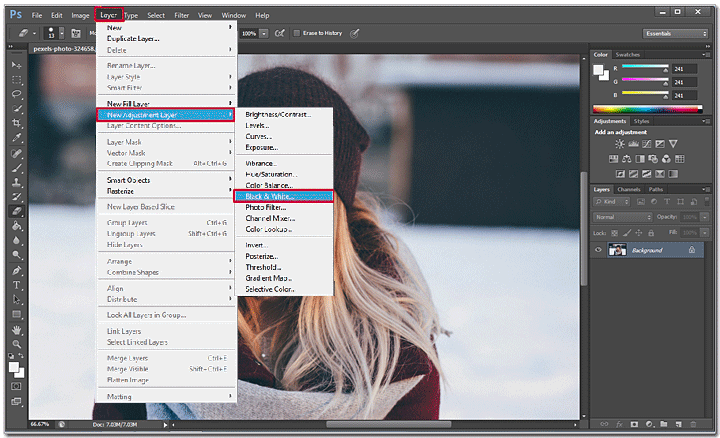 Launch Photoshop and open the image you want to edit. Go to the top menu and choose Layer > New Adjustment Layer. Then pick Black and White. Move the color sliders to lighten or darken certain areas. Alternatively, save some time and pick a pre-made preset. Don’t forget to hit Ctrl+S and save the new image. 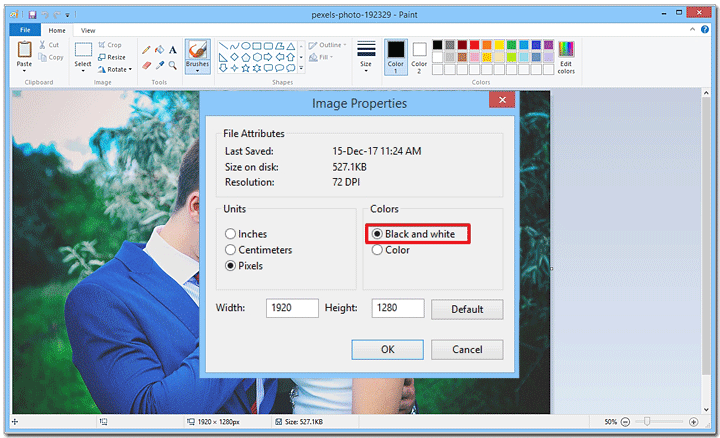 If you are working with Photoshop CS2 or Photoshop Elements, the Black and White mode described above may not be available for you. In this case, I suggest creating the Adjustment layer in the Saturation mode. All these Adjustment layers and sliders for different colors may sound tricky for some users. But once you get into it, you will make the edits on the go. The trick is, do you want to get into this? If you don’t, look for some other black and white picture maker. Anyway, now you know a few ways to turn color photos into black and white. Now decide which one is suitable for you, grab your picture and make it happen! About the author: Matt Cooper is a professional photographer who specializes in taking portrait shots. Black and white photos make a massive part of his portfolio. Give your photos a professional look!